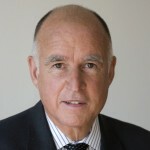 SACRAMENTO — Gov. Jerry Brown has voiced support for a U.S. commemorative postage stamp that would honor the patriotism of the Japanese American World War II soldiers. His letter was sent to U.S. Postmaster General Megan Brennan in time for Memorial Day, as the nation remembered those who died while in service in the Armed Forces. During World War II, over 800 Japanese Americans soldiers perished. Executive Order 9066, signed in February 1942 by President Franklin D. Roosevelt, led to the incarceration of over 120,000 Japanese Americans. This letter is a first from a state governor. Other letters of support for the stamp project have been sent by numerous city, county, and state officials, as well as 32 members of Congress who joined Reps. Mark Takai (D-Hawaii) and Judy Chu (D-Pasadena) in backing the stamp. The 11-year campaign continues to push forward as the U.S. Postal Service considers the proposal. If issued, the stamp would be the first to feature a historical subject from the Asian American Pacific Islander community. Despite the incarceration, over 33,000 Japanese Americans enlisted in the U.S. Army during the war. Many enlisted said that they did so to show their patriotism. Most served in the 100th Battalion/442nd Regimental Combat Team in Europe and in the Military Intelligence Service in Asia and the Pacific. These groups are considered among the most decorated in the nation’s history. Supporters are being asked to contact their governors by email and phone, which can be found on their governors’ websites. Also, people are being encouraged to continue to reach out to members of Congress and to sign a petition on change.org. As of June 20, 9,818 people have signed. For more information, visit the campaign’s website, www.StampOurStory.org. This is a proper and just gesture to our veterans and families.